Ya Hayyo Meaning in English - The Ever Living One: Allah is the ever living one because He lives from the beginning and till the end and He gives life to everyone. A scholar of Islam says about Ya Hayyu quality of Allah that Hayy is one who do all the work, if you recite this fantastic Name you will have life in your every work, your heart will live forever and your soul attracts towards His creator. How To Stay Healthy Forever In Islam: Health is the blessing and adorable gift of Allah. To enjoy this gift then health is necessary so always pray to Allah in every prayer for your health. To maintain the health, recite Ya Hayyu 3000 times and you will stay healthy and if you will sick then you will recover soon, a scholar says that if you will apply this in your life then you will never be sick. 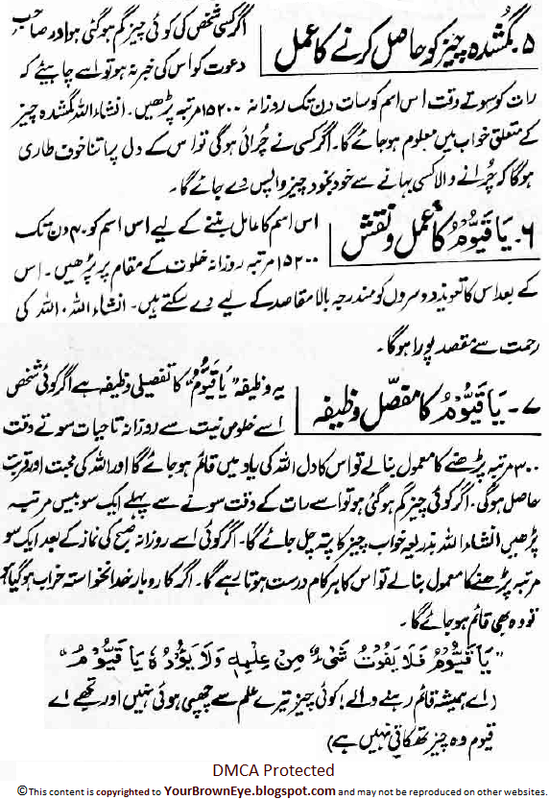 How To Recovery From Every Disease: Read Ya-Hayyo to recover from every disease, so if anyone wants to become its scholar then for that choose a clean place where you can worship Allah then on that place recites this 10,000 times and if you are thing about how many days then answer is 110 days. High Blood Pressure Treatment In Islam: Ya Hayyu is very beneficial for high blood pressure. In order to control the high blood pressure and make it normal then recite this Holy Verse seven times on a glass of fresh water and use this H2O. Treatment of Paralysis In Islam In English: In paralysis, some parts of the body stop working or means dead. So the paralysis patients have to recite Ya Hayyu wazifa and also continue the medical treatment. Becoming A Doctor In Islam: Every doctor and hakim wish is that from them every patient can recover from his/her disease. So for that good reason, recite this before opening the clinic 1100 times because this will help your patients and also good for your noble profession. Successful Operation Wazifa Kamyab: Life and death is in the hands of Allah and every doctor who wants their every operation become successful then every day before going to hospital or clinic recite this Amazing Name of Allah in the morning and also at the time of operation. 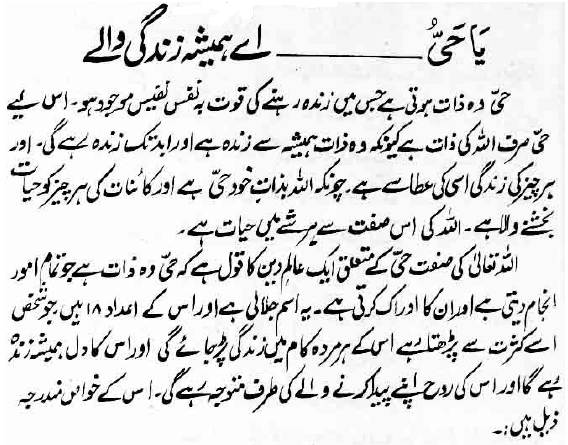 Wazifa For Safety From Accidents: To do such works in which any kind of accident can happen like to give duty of driver, to work on machine, to do a job of army, people related to fish farming business, boat man, drivers and a person who go hilly areas and wants to come back home safely etc can read this Name 100 times so that they can safe from accidents. Ya-Hayyu Name Information In English: Ya Hayyu is useful to fulfill wishes, recovery from diseases and to give passion to passionless. If a sick person recite this for 141 times he will recover from diabetes, blood pressure and paralysis. Amal: If anyone’s disease is not recognized then writes this Name for 3 times with saffron in chine plate and then drink it He/she will recover soon.